Joanne Rocklin is the author of many books for children, including The Five Lives of Our Cat Zook, which won the Golden Kite Award and was named to Florida’s Sunshine State Young Readers Award master list. Lucy Knisley is a critically acclaimed comic creator and author of the New York Times bestselling graphic memoir Relish. "Rocklin captures a lesser-seen slice of contemporary American urban life: how the more troubling parts of our world trickle down to and effect upper elementary students as they encounter prejudice in its many forms. Penny’s optimism and resolve is a joyous testament to our complicated world." "Rocklin tackles important and topical issues"
"Penny’s voice is precocious and compassionate, and the way in which she reacts to the events around her rings true." 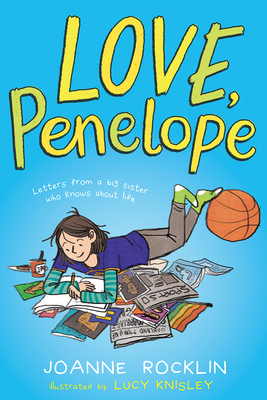 "A tale of life, family values, basketball, and growing up, Penelope’s story will ring true for a wide audience of readers."